My dear friend Dar loves loves loves lettuce wraps. As Rob and I were assembling this delicious dinner I could not get her off my mind. So we called them the “DD wraps” in honor of our lovely friend, Dar. 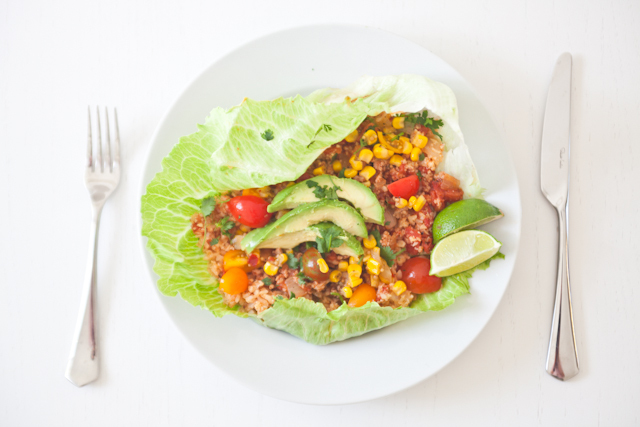 She is refreshing and and light and amazing… just like these wraps. 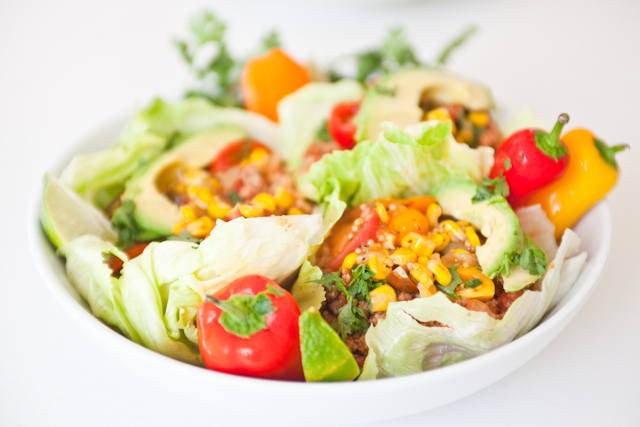 Full of color and flavor… not to mention a HOST of nutrients! Dig in! Use half the chopped onion and 1 teaspoon garlic, sauteing for about 5 minutes (you can use oil if using a non-stick pan). Then add the cauliRICE with half a packet of taco seasoning (should be about 2 tablespoons worth of seasoning) and saute for another 5 minutes. Add about 1 1/2 -2 cups of tomato sauce to the cauliRICE, stir, cover and let simmer for about 5 minutes. Stir again, and simmer for remaining 5 minutes. (Total 20 minutes in the pan). You can eye it here… if you prefer it to be softer, give it a little more time. This is pretty hard to mess up. My kind of dish! Meanwhile, saute the rest of the yellow onion in a separate pan until soft. Add the remainder of tomato sauce (about 2 cups worth) and simmer for about 15 minutes. Rinse the lettuce leaves and make “cups” out of the lettuce (you cant be a perfectionist here). Add cauliRICE, top with ground turkey. Add corn salsa, avocado and organic sour cream (if you are not dairy free, the sour cream adds an amazing touch to these tacos.) Enjoy! Side note: You can prepare the cauliRICE and ground organic turkey the day before, keep in an airtight container in the refrigerator and serve the next day with very little time and prep. This is a great option for a dinner party. I am honored that something so scrumpcious would have my nickname attached. Glad I dropped by to try this the other week. 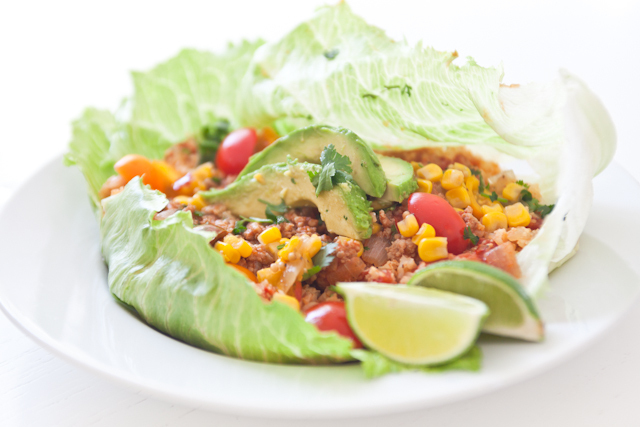 It is my new favorite lettuce wrap for sure! Hopefully Z will give me some time to make it soon.